Cole-Parmer's new gear pump drive offers simple variable speed control for fluid handling applications. 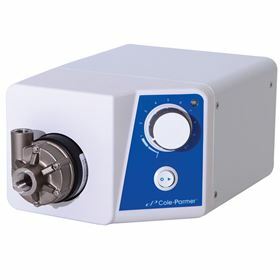 Cole-Parmer, manufacturer of fluid handling and test and measurement products, has announced the introduction of its new console gear pump drive for fluid handling applications. The new drive offers simple variable speed control for fluid handling applications. When coupled with an appropriate gear pump head, the new drive handles system pressures up to 21 bar, differential pressures greater than 5 bar, and flow rates up to 5850 mL/min. This means it can be used for applications such as pressure filtration and also in other laboratory- and industrial-scale, continuous-duty flow applications. The pumps feature 100:1 speed-control to deliver fluid over a wide flow range. A separate power switch enables the pump operator to maintain the speed setting when turning the drive on or off. Remote control of start or stop is available via DB9 connector on the back of the drive. Gear pump heads can be purchased separately and are available in cavity or suction-shoe configuration and offer pulseless, accurate and repeatable fluid delivery.